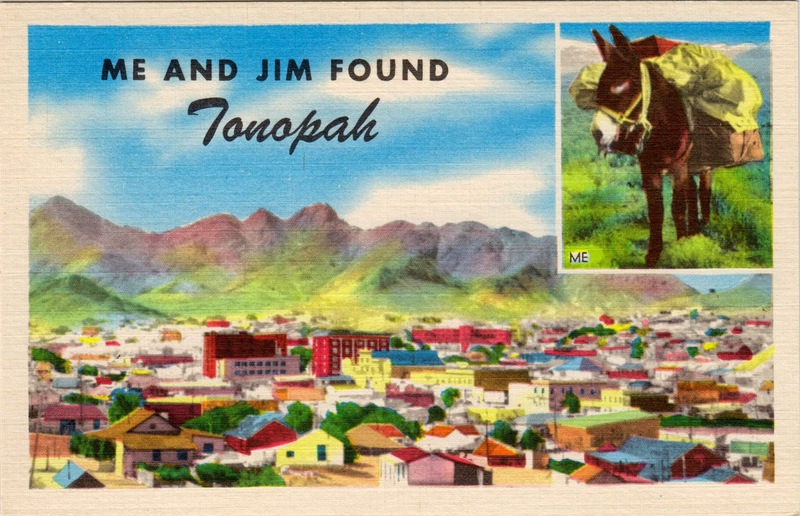 Postcard US-3100087 to Ukraine was purportedly from "me", the mule on the top-right insert, and my owner Jim after we found Tonopah at the junction of U.S. Routes 6 and 95, about half-way between Las Vegas and Reno in Nevada in the 1950s. "Here we are in Tonopah, Nevada, that great silver mining camp that for a generation was the nation's greatest producer of silver. A beautiful, modern little city, but DIFFERENT. Fine highways leading everywhere; finest of hotels and torist accommodations; unexcelled climate; good stores, schools, theatres. Best of hunting and fishing in season. Noted gaming palaces. You only live once - be sure and visit Tonopah. It IS different." Tonopah is a the county seat of Nye County, Nevada with a population of 2,478 in 2010 census and a total area of 16.2 square miles or 42 square kilometers.